Use the ready made theme colors for a professional look to your documents. Xara Cloud uses Theme Colors. Change a theme color and you change the appearance of that color throughout the whole document. It’s a simple one click operation. And the fact that we use theme colors mean that documents always have a professionally designed look and feel. 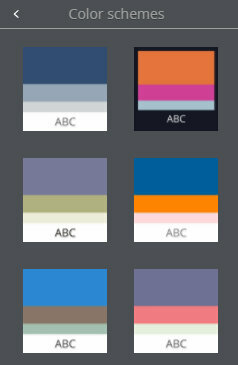 There is a selection of Ready-made color schemes for you to use - just tap on the option at the bottom of the Color Picker and the schemes will slide in on their own panel. Tap to choose a scheme and it will replace the existing theme in your document and become the main theme in the Theme colors panel. Note that your document must contain a designated “Theme color 1” or you won’t see the themes - most of our templates have ready made color schemes for you to choose from. Check out this tutorial for more info on Color Schemes in Xara Cloud.